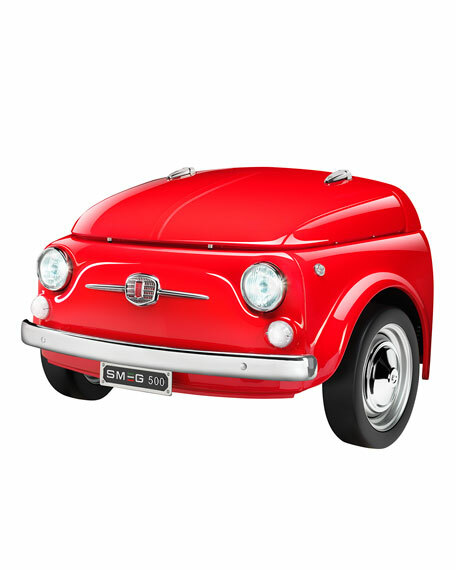 Smeg and Fiat merge form and function to create an extraordinary new item for the FIAT 500 Design collection. Because a refrigerator is not just an electrical appliance, and a bonnet is not just car part. 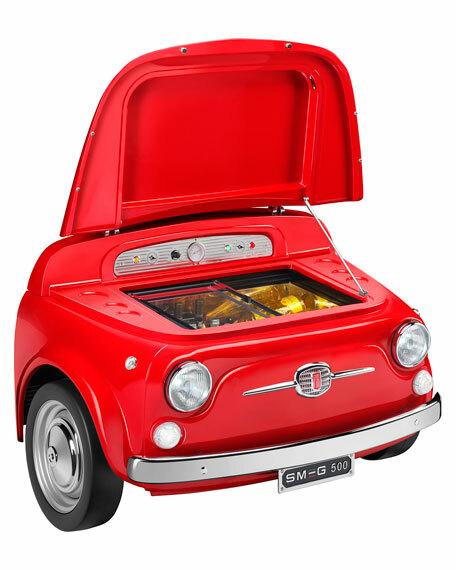 The two Made-in-Italy advocates already met in the 1950's (the years of mass automobile production and of "white goods" development) when Fiat, with the invaluable collaboration of Smeg, also manufactured refrigeration. Today Smeg and Fiat contaminate, amalgamate, and surprise with an inspirational new design. 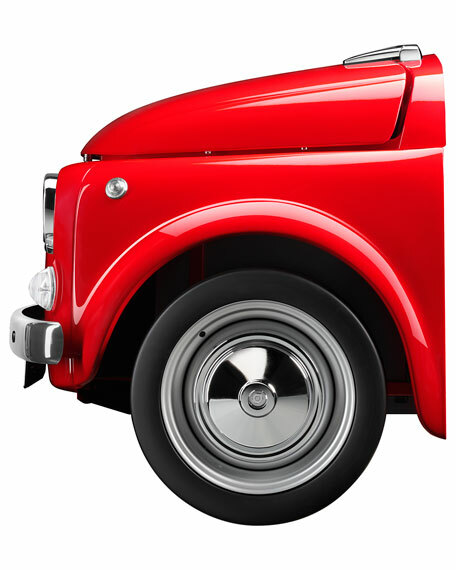 A section of a car, it doesn't move, but it still takes you on a journey, it transforms a regular space into something unusual. Creativity is injected into the rigor of technology, forming a cooler that fulfills its functions but has a new guise, becoming an item that catches your eye, tricks it and turns into something you have never thought was possible. 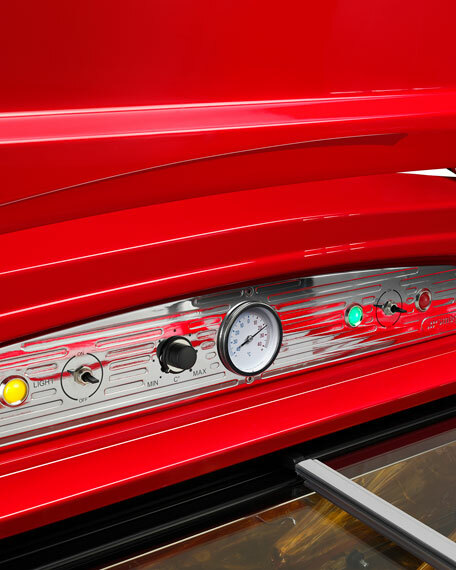 The Smeg 500 is not just a cooler, it is a crossbreed of concepts for exclusive spaces, from a collector's house to a lounge bar for fashion drinks. 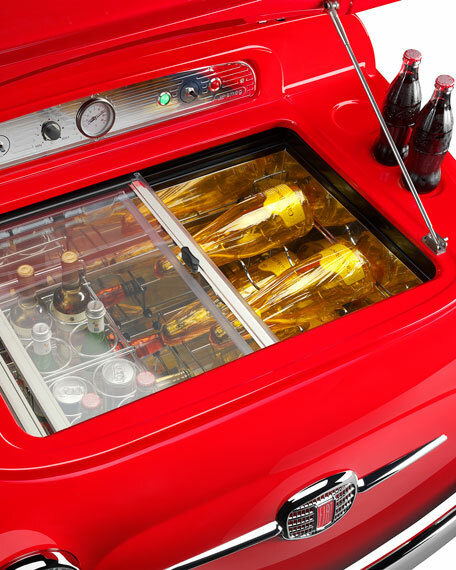 Handmade cooler with genuine Fiat 500 parts. Bonnet hinges with vintage style. One removable shelf for canned drinks. Open/close with two sliding glass doors. Stainless steel, PMMA, aluminum, polystyrene, glass and plastic. 49.2"W x 31.4"D x 32.6"T.
A special antibacterial protection on the appliance's interior walls prevents bacterial growth and keeps them clean. Nevertheless, they must be cleaned regularly in order to keep them in good condition. Cleaning the outside of the appliance: The appliance may be cleaned with water or alcohol-based liquid detergents (e.g. window cleaning products). Avoid aggressive detergents and rough sponges to avoid damaging the surfaces. Cleaning the inside of the appliance: Clean the interior with diluted liquid detergent or with warm water with a little vinegar added. Remove any ice thicker than 3-5 mm. Do not use sharp objects or spray products. Risk of damage to surfaces: Do not use steam jets to clean the appliance. Do not use cleaning products containing chlorine, ammonia or bleach on steel parts or parts with metallic finishes on the surface (e.g. anodizing, nickel- or chromium-plating). Do not use abrasive or corrosive detergents on glass parts (e.g. powder products, stain removers and metallic sponges). Do not use rough or abrasive materials or sharp metal scrapers. Power voltage Danger of electrocution: Turn off the appliance and unplug it from the mains before cleaning. Do not pull the cable to unplug the appliance. Defrosting the refrigerator compartment: The cooler compartment does not require defrosting, as any ice which forms on the refrigeration plate will melt when the compressor is idle. If ice thicker than 3-5 mm should form on the inside walls of the refrigerate.